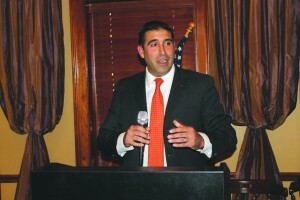 BATON ROUGE— Metro Councilman John Delgado brought his campaign for Mayor-President to the Ronald Reagan Newsmaker Luncheon Tuesday and outlined his plans for City-Parish government, especially fighting crime. He said crime is the No. 1 problem facing the parish, and he wants to add 200 officers to the Baton Rouge Police Department. The outspoken Republican who takes a liberal position on some hot button issues was given a chance to back off from some of his harsh attacks against conservatives in the past, but he refused to do so. When asked if he would retract his comparison of supporters of incorporating the City of St. George with the Taliban (a terrorist group in the Middle East), Delgado said he was not very politically correct and that the comment was made during “a heated time,” but he did not retract it. The first-term Councilman said he will help create good-paying jobs with economic development. One untapped resource is the parish’s 12 miles of undeveloped river frontage. nity, One School System.” he said.